Larkspur Ferry Terminal (LFT) has an access problem: not enough people can get to the ferry. This shouldn’t be solved with parking garages, but rather with a shuttle and parking district in the short-term and transit-oriented development in the medium to long-term. But the terminal itself can only take so much ridership. In our fourth and final installment, we’ll examine the existing need, potential need, and the real and legal constraints on ferry service from LFT. At the moment, LFT is about 45 passengers over capacity on the morning rush hour departures. These benighted folks need to take an overflow shuttle bus into the city rather than the much more luxurious ferryboat. If GGT adds access for 500 more people to take the ferry, as seems to be desired, that would aggravate the overcrowding. Adding capacity isn’t trivial. Though there are enough vessels to take people, there aren’t enough crew. Each vessel needs a captain and a crew, but these folks need to be paid for a full day, and there isn’t any need for a third full-time crew because of very low mid-day demand. While GGT is considering using one of their licensed office staff members as a captain for one morning departure as a cost-saving measure, there will be too much demand if ridership continues to increase and access is boosted as planned. Rush hour, under the intense TOD scenario I outlined or from the SMART Station Area Plan, would probably bring about 350 extra riders, along with 120 or so from SMART and another 450 from parking expansion. If 70 percent of them use the ferry at the peak of the peak, that means another 600-650 ferry riders in the morning, or enough for one more peak hour ferry departure, which means yet another crew. To make this make financial sense for GGT, the agency needs to figure out how to boost reverse-commute ridership and mid-day travel, which will mean more intense, or at least more interesting, development at Larkspur Landing. That, in turn, will probably require more trips. How far can GGT go? Corte Madera Channel. Image from NOAA. Like all transit, ferry capacity is measured in how many vehicles of what size can be accommodated per hour. 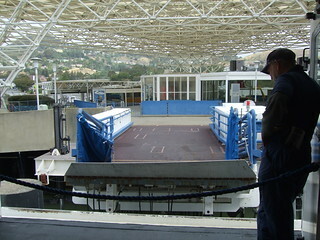 Physically, LFT is constrained by the size of the 2-mile long Corte Madera Channel, which provides an outlet for the ferries. It’s wide enough (about 265 feet) that two ferries can pass, but with a depth of only 9 feet it’s relatively shallow, so boats with even a moderate draft (how deep the boat’s hull goes under water) won’t be able to use it. Logistically, LFT is constrained by its need for high-speed catamarans, which have a lower passenger capacity than slower monohull vessels. The largest catamarans in GGT’s fleet can fit 450 people, while its slower Spaulding monohull vessels can fit 715. Passenger demand for fast service to the Embarcadero wins out over capacity here. Environmentally, LFT is further constrained by the need to protect the marshland around the Corte Madera Channel. Too many departures and the wakes will erode what is very rich habitat. To help combat this problem, GGT has limited the number of crossings between LFT and San Francisco to 42 per day. Each crossing, whether from or to San Francisco, uses one of those slots. GGT is further constrained by the number of high-speed vessels in its fleet. With only 4 vessels, it can only run 3 departures per hour. But if we leave aside the environmental and fleet concerns and focus solely on the physical and logistical ones, we find that GGT could probably get 6 departures per hour from LFT. The highest-capacity catamarans that can sail the channel can hold about 500 passengers, so we can get 3,000 peak passengers per hour from LFT to San Francisco and vice versa. This is approximately 1.5 highway lanes worth of capacity in each direction. The Ferry Building should be able to handle that kind of intensity from LFT, but GGT may need to find or build a new berth in San Francisco. To achieve this level of service, GGT would need eight vessels total – seven running and one in reserve. * The MV Del Norte, runt of the fleet, would need to be retired and the other catamarans would need to be retrofitted to fit 500 passengers. Five new vessels and three refurbishments should add out to about $56 million. Operating cost per hour of this maximum service is $12,420, so if GGT ran this for four hours per weekday, it would be about $13.2 million annually, less passenger fares, of course. Anything above this level of service would require a deeper channel, which would be more expensive to build and maintain. As mentioned above, not only does GGT not have the fleet to run its maximum service but it’s limited to only 42 crossings per day. Using up 24 of those on rush-hour service isn’t going to cut it. Instead, we can reasonably assume a capacity of three departures per hour, or about 1,350 passengers per hour. It’s not fantastic, but that’s how much capacity the system is considering. If GGT adds more service than this, and they very likely will need to, it will need to carefully manage its fleet, perhaps by running an asynchronous schedule. Two vessels would run between San Francisco and LFT all day, while three would only run during peak hours and remain in reserve in San Francisco during the day. This should allow it to stay within its needed 42 crossings without allowing headways to get too high or sacrificing late-night and early-morning service. Alternatively, GGT could request more crossings from neighbors and the state. This would require a new environmental impact report that would identify mitigating measures to lessen the damage on the nearby wetlands. Under this route there’s a chance their request would be denied. GGT must smooth its ridership profile through TOD. There is no other way for it to achieve continued ridership growth in a sustainable way. Ever-higher peak demand will be burden the system with high crew costs and wasted capacity. GGT can do this by shaping the development at Larkspur Landing and inviting SMART to build closer to the terminal (and therefore draw San Francisco commuters heading north). But GGT must also be careful not to overload its southbound capacity. Even at its theoretical maximum, GGT’s Larkspur ferry cannot move as many people as a rail line, and it cannot just pack the ferries ever-tighter as BART does. A better Larkspur Landing will have new development, new parking capacity, a reinstated shuttle, and enough ferry capacity going in both directions. It will be a net positive to the transit agency’s bottom line and to its mission to take people off the bridge. It will boost the profile and financial situation of Larkspur and Marin County. New parking garages are the easiest but least effective way to boost access to LFT and improve the financial situation of GGT. It’s vital the agency look beyond those garages and to a better, stronger future. *The total minimum round-trip is 70 minutes: 5 minutes loading/unloading at LFT, 30 minutes transit to SF, 5 minutes loading/unloading at SF, and 30 minutes transit back to LFT. Longer headways that don’t evenly divide into 70 would need to add time to the layovers. Good article, and answers my question about how GGF will accomodate more riders once SMART arrives. I guess the answer is, not easilly. Also, higher capacity increases the need for dredging, as the wakes erode the channel. From what I’ve read, major dredging happens once every 3 years, and involves approval of federal funds as the Army Corps of Engineers gets involved. At very low tide when dredging hasn’t happened recently, the channel may be very shallow, so the ferries move slowly and may not be able to pass, which would affect the maximum number of trips.